I had been at an Anti War rally which walked from Trafalgar Square to Downing St. I was on my way home. I’d taken a lot of photos of the rally in the square and of the protest outside Downing St. 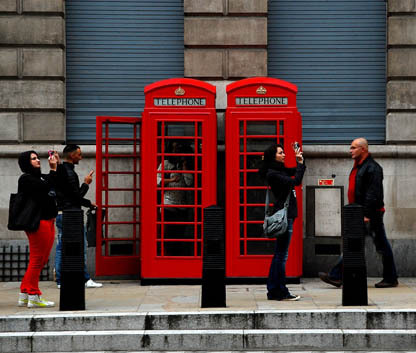 Taking some photos of telephone boxes and tourists was a light relief. I took six shots in quick succession centred on the two telephone boxes. I love telephone boxes and struck lucky with the convergence of symmetry and colour. I took my first photos with my Mum’s Ilford Box camera in the 1950’s. I learnt how to process black and white at Blandford Secondary Modern School and my summer job before starting an engineering apprenticeship in 1962, was camp photographer at Rockley Sands Caravan Holiday Camp near Pool in Dorset. Photography continued to be one of my pastimes for the next few decades and I have a lot of photos in the attic, but I only rediscovered the enthusiasm of those early years again, when I took up digital and four photogenic grandchildren came along. Shortly after I was introduced to Flickr which is a great outlet for my ego! I have a Nikon D40 (usually regarded as an entry level SLR). On the day I took ‘See Red’ I had bought a new lens, a Sigma 17-70mm at Spectrum on Tottenham Court Rd, one of the few real camera shops still existing. I also have a Sigma 70-300mm which I also bought at Spectrum, as I did my D40 and my first digital camera which was a Konica Minolta Z5 Dimage. I’m always thinking about ‘up-grading’ but find the D40 reliable and light and the Sigma’s extend it considerably too. I like to record things, capture moments, document what I see. To get a satisfying image, with symmetry and good proportions. Colour and light is key too and I am drawn to it. Walking home from work tonight the early evening below zero clear sky was brilliant and luminous and I thought, now if I had a tripod with me…… mind I also thought there are limits to the sacrifices I’ll make in the pursuit of my pastime, it was very cold! Flickr has also enabled me to share my photos with other enthusiasts and I like that too. I love buildings, birds and butterflies and everything which lights up my life. To some extent it goes with the season, recently, I’ve been photographing a lot of ducks. It also hinges on what I’m doing and where I am. I’m always on the look out for a photogenic subject. I mainly use natural light. I’ve no experience of specialist lighting and only recently learnt a bit about taking photos in low artificial light without flash. Previous PostStories of the World annual conference at Leeds City MuseumNext PostThe Land of Hopeful Commuters – Londoners, we need you!